Maciun (out of stock…erggggg! I love love love this pattern, the cut is almost irrelevant to me. I usually prefer fitted at the waist but of course, as I’ve mentioned I’m a big belter. I mean I wear belts a lot, I don’t punch people). If anyone sees this elsewhere please let me know. I really love her designs. Helmut Lang (this might be the perfect everyday dress. The color is to die for, the cut is interesting but not fancy. I could wear it with my gladiators or heels. Only problem is the price. 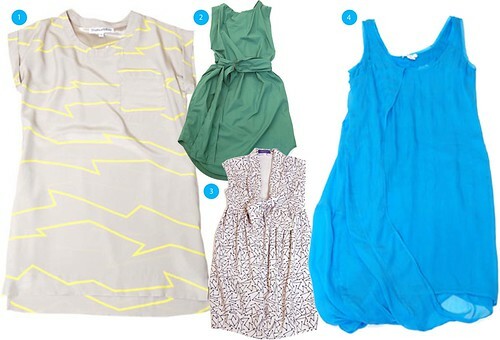 I really like these dresses posted by Betsy of Fashion is Spinach too. 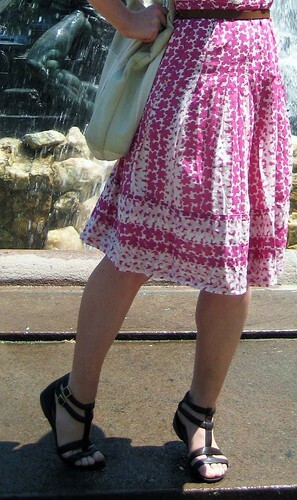 Here’s the dress I wore on Memorial day. I don’t like the top half of the photo. I’m kind of awkward in photos. I need to take lessons from Jennine and Susie. I like having pictures taken but then I don’t like seeing them. Plus, I don’t like my haircut. So I chopped this photo in half. You get the picture. Here’s a Marc Jacobs T-shirt I bought at Filene’s this afternoon to help the economy. That’s the only reason. Life and little treasures. Patterns everywhere. 4 Responses to Bird Dresses: Easy + Breezy round-up. + My memorial day dress + economic stimulus contribution. oh yeah… getting pictures taken is indeed tough… but you’re doing so well! i love the pink ! Oh, I’d love it!! Let’s. Thank’s Jennine, you just do it with such aplomb.